JOHANNESBURG – ZIMBABWE’S ruling elite has come under criticism for seeking medical treatment in neighboring South Africa while leaving the majority exposed to death at ill-equipped hospitals back home. 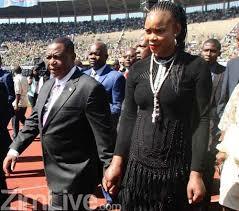 This follows Vice President, Constantino Chiwenga, and his wife, Mary, being flown to Cape Town after losing skin pigmentation. The African Diaspora Forum (ADF) criticised the move, which comes months after Chiwenga ordered the firing of doctors striking over poor salaries and working conditions. drew the example of recently-deceased music legend, Oliver Mtukudzi who still sought treatment in Zimbabwe despite his battle with the deadly diabetes. In a separate interview with CAJ News Africa, Zimbabwe Communist Party (ZCP) secretary general, Ngqabutho Mabhena said VP Chiwenga and his wife would not persecute medical when they simply asked better working conditions and living wage. “They must go back to Zimbabwe, they cannot destroy medical facilities and then travel abroad whenever they need medical attention. Workers (nurses and doctors) in the Cape Town hospital should boycott treating them – this they will be doing in solidarity with their counterparts in Zimbabwe are persecuted by VP Chiwenga and his political friends,” said Mabhena. Chengeto Munetsi, a Zimbabwean woman based in Cape Town, said medical tourism was tantamount to corruption. “Enough is enough. The masses must rise to effect protests disapproving misplaced priorities,” she said. In 2018, President Emmerson Mnangagwa splashed a minimum of $550 000 chartering a private Gulfstream 650 plane from Qatar to allow former first lady, Grace Mugabe, to travel to the funeral of her mother. The Mugabes usually seek treatment in Asian hospitals. Zimbabwe’s health sector, among the best during the country’s independence heyday in 1980, has crumbled amid economic problems.